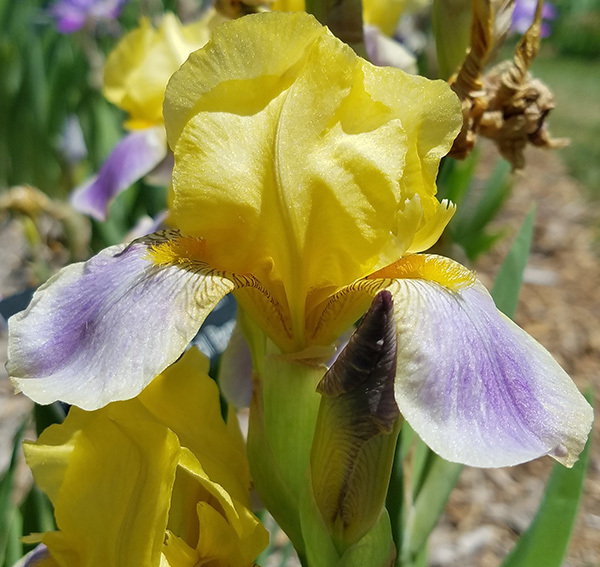 An exhaustive collection of Irises exhibited by NEMMIG. MTB Aachen Elf – (Lois Kennedy, R. 1984). Seedling #845-76-1. MTB, 20″ (51 cm), Midseason bloom. Standards yellow; falls lavender, edged yellow; yellow beard. ‘Topsy Turvy’ X ‘Floridor’. Redstone Nursery 1984. High Commendation 1979, 1981; Honorable Mention 1986; Williamson-White Award 1988. TB Absolute Treasure – (Richard Tasco, R. 2005). Seedling 99-TB-06-01. TB, height 42″ (107 cm), Mid bloom season. 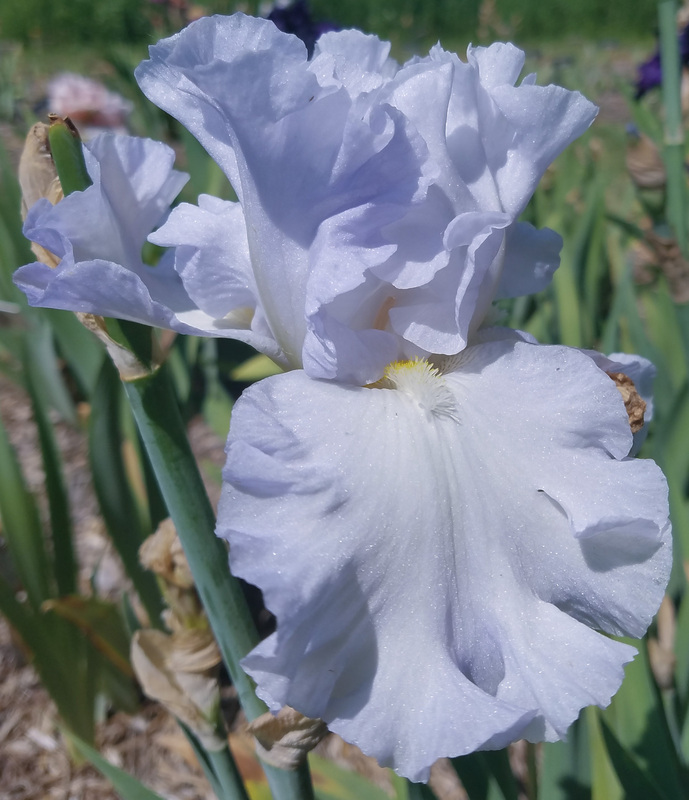 Sky blue self, style arms slightly lighter toward back, falls slightly lighter centers; beards white, tipped golden yellow in middle and throat, frosty white at end; heavily ruffled; slight sweet fragrance. ‘Sudden Impact’ X ‘Color Me Blue’. Superstition 2006. Honorable Mention 2008, Award of Merit 2010; Wister Medal 2013. ‘Acoma’ 1990 (Tom Magee, R. 1987). Seedling 8248. TB, height 30″ (71 cm), Early bloom. Standards pale blue; Falls ivory with light violet plicata pattern on edge; henna beard; ruffled. 8038A: (((Cook 2754 x ‘Claudia Rene’) x ‘Orchid Brocade’) x A. Johnson 70220B: ( ‘After All’ x ‘Moon River’)) X ‘Capricious’. Long’s Garden 1990. Honorable Mention 1992; Award of Merit 1994; Wister Medal 1997. ‘Alpine Lake’ 1980 (Dorothy and Anthony Willott, R. 1980). Seedling #78-51. MDB, height 6″ (15 cm). Midseason to late bloom. Standards white, slightly tinted blue; falls light blue (RHS 104D); pale blue beards. 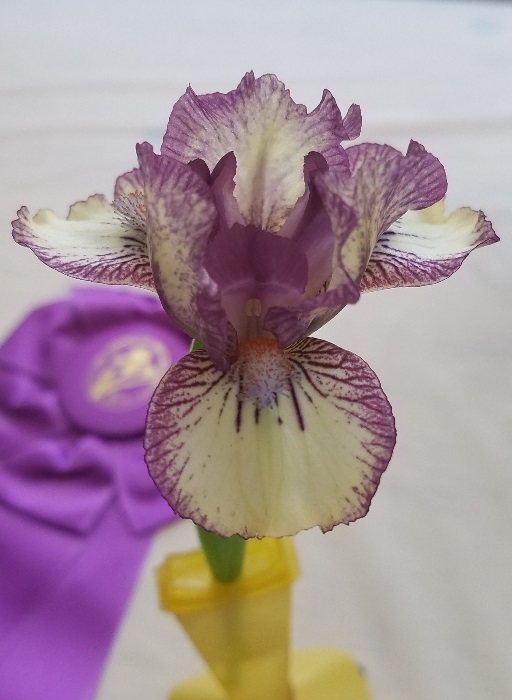 Seedling #74-46: (‘Carousel Princess’ x ‘Gunga Din’) X Greenlee seedling #GX-11. Willott 1981. High Commendation 1980; Honorable Mention 1983; 2nd Vienna 1985; Award of Merit 1986; Caparne-Welch Medal 1989. TB Altruist – ( Schreiner, R. 1987). Seedling T 115-B. TB, 37″ (94 cm), Early midseason bloom. Standards flax blue (HCC 6/42), white midrib; Falls flax blue, chalk white center; white beard; ruffled and fluted. L 23-6: (G 125-2 x ‘Victoria Falls’) X ‘Tides In’. Schreiner 1987. IB Ask Alma – (Carol Lankow, R. 1986). Seedling #4B32-7. 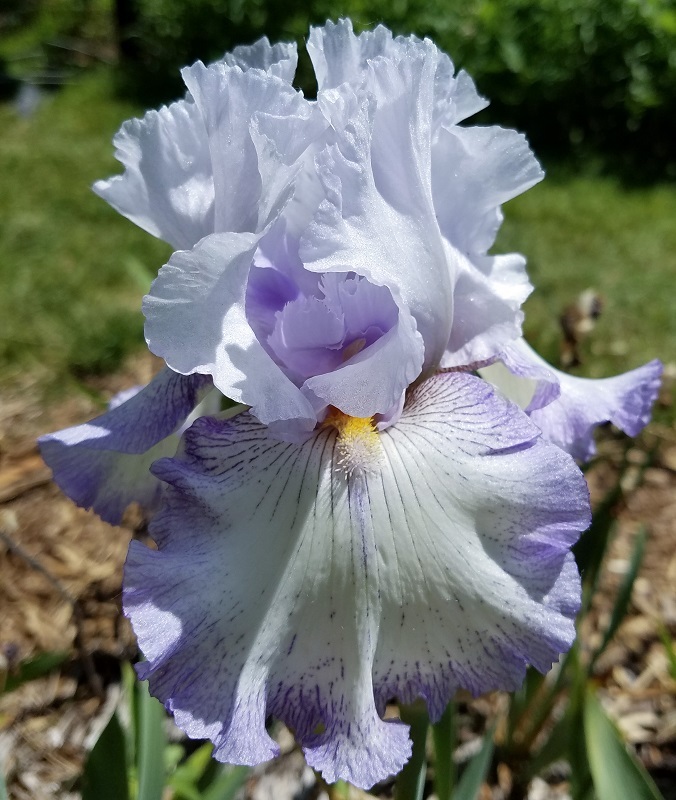 IB, height 21″ (53 cm), Midseason bloom. Coral orange self; white beard tipped tangerine orange. ‘Pink Pirouette’ X Wright seedling #L56: (Wright seedling #L32: ((‘Pink Cushio’ x ‘Lenna M’) x ‘Amber Shadow’) x ‘Cotton Blossom’). 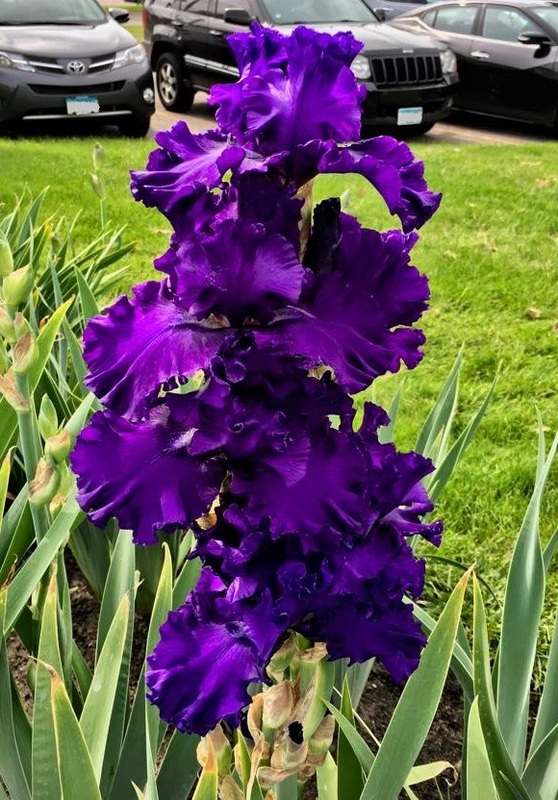 Kirkland Iris, Riverdale Iris 1987. Exhibition Certificate 1986; Honorable Mention 1989; Award of Merit 1991; Sass Medal 1994. SDB Autumn Jester – (Chuck Chapman, R. 2000). Seedling 92-12-1. SDB, height 13″ (33 cm), Early bloom and rebloom. 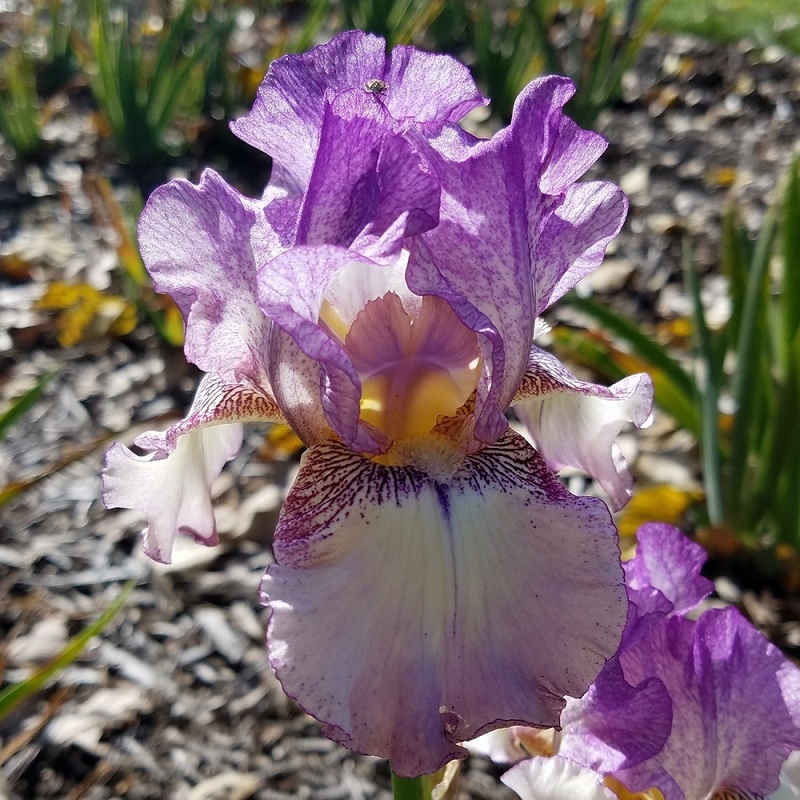 Purple self; beards purple; taller (22″) on Fall rebloom. ‘Forever Blue’ X ‘What Again’. Chapman 2000. ‘Autumn Queen’ (Hans Peter Sass, 1926). DB, Early bloom and rebloom. Color Class-W1. 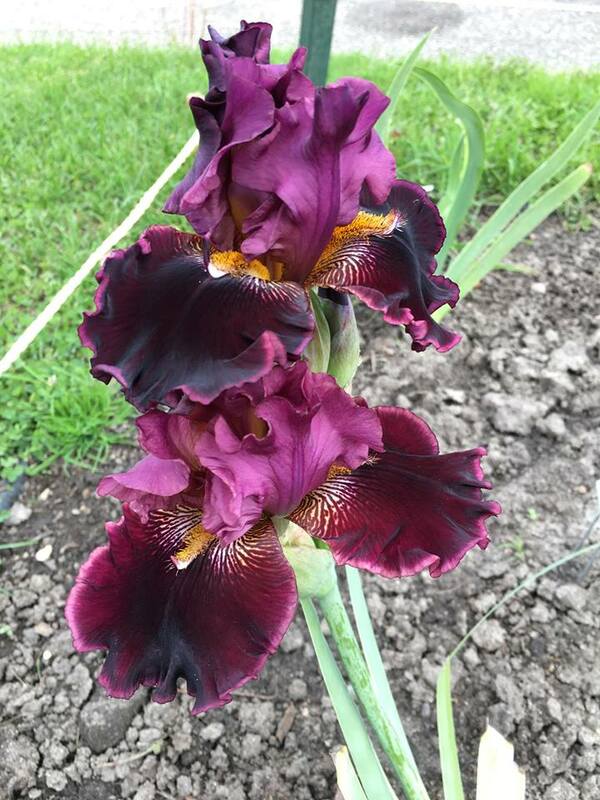 Note: Also listed in Sdb web because of height variation: ‘Autumn Queen’. ‘Autumn Rain’ 2008, Sutton (Michael Sutton, R. 2007) Seedling Q-38-AA. TB, 33″ (97 cm). Midseason late bloom and rebloom. 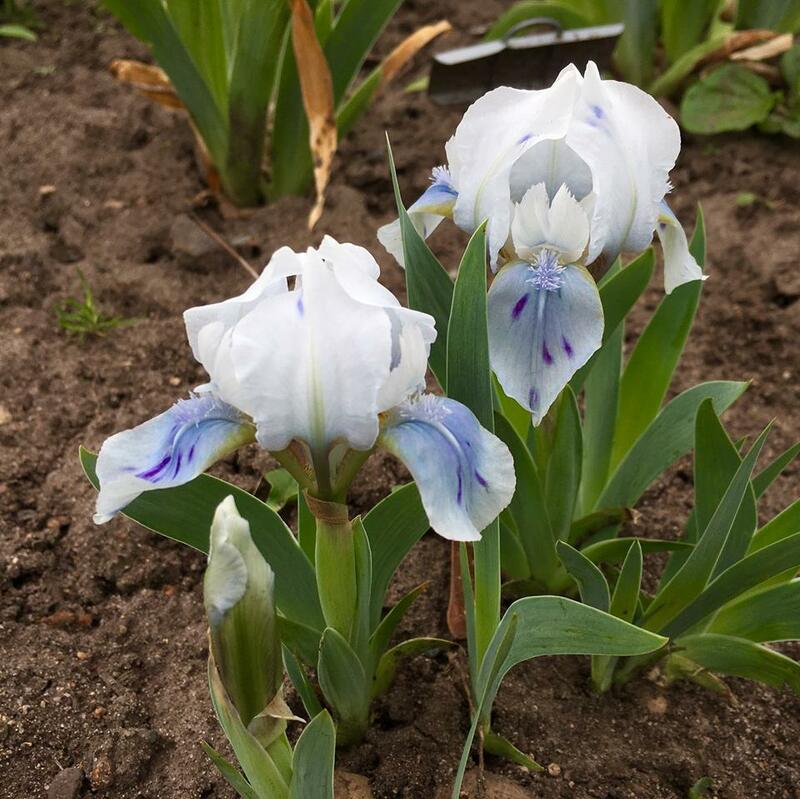 Dark violet (RHS 86A) self; beards ice white, pale yellow in throat; pronounced sweet fragrance. ‘Speeding Again’ X ‘Snow Melt’. Sutton 2008. ‘Autumn Tryst’ 1993, Weiler ( John Weiler, R. 1993). Seedling 86-118-1RE. 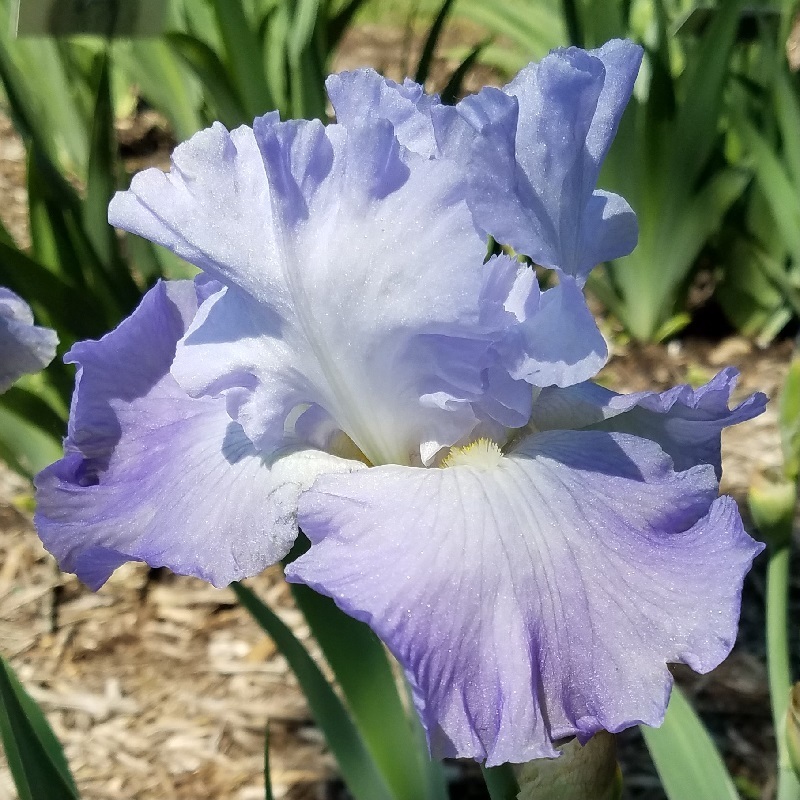 TB, 34″ (86 cm), Early midseason bloom and rebloom. Standards white, shot, stippled and edged rosy lavender; Falls white, edged rosy lavender; beards pale yellow; slight sweet fragrance. ‘Lilac Stitchery’ X ‘Earl Of Essex’. Rialto 1993. TB Avalon Sunset – (Schreiner, R. 1994). Sdlg. DD 833-1. TB, 36″ (91 cm), Midseason late bloom. 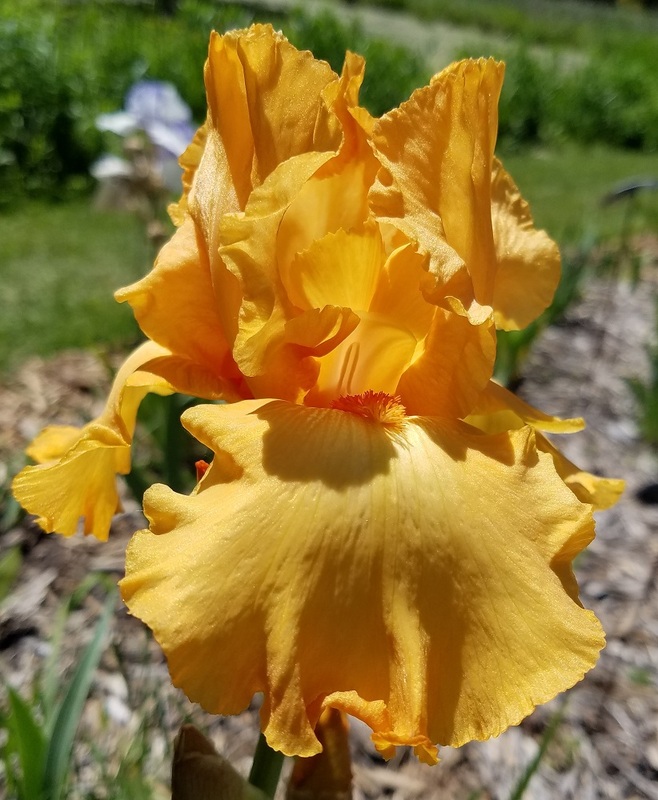 Ruffled orange (RHS 23A); beards tangerine. ‘Fresno Flash’ X Z 403-A: (S 656-1: (( ‘Pinafore Pink’ x ( ‘Oraglow’ x unknown)) x ( ‘Something Else’ x (G 1212-A: ‘Golden Ice’ x ‘Celestial Glory’) x ‘Flaming Star’) x ‘Gold Trimmings’))) x S 494-C: ( ‘Vanity’ x (G 1292-B: (((N364-1 x ‘Whole Cloth’) x ‘Prairie Clover’) x ‘Distant Chimes’) x ‘Loudoun Charmer’))). Schreiner 1994. Honorable Mention 1996. SDB Baby Blessed – ( Lloyd Zurbrigg, R. 1979). 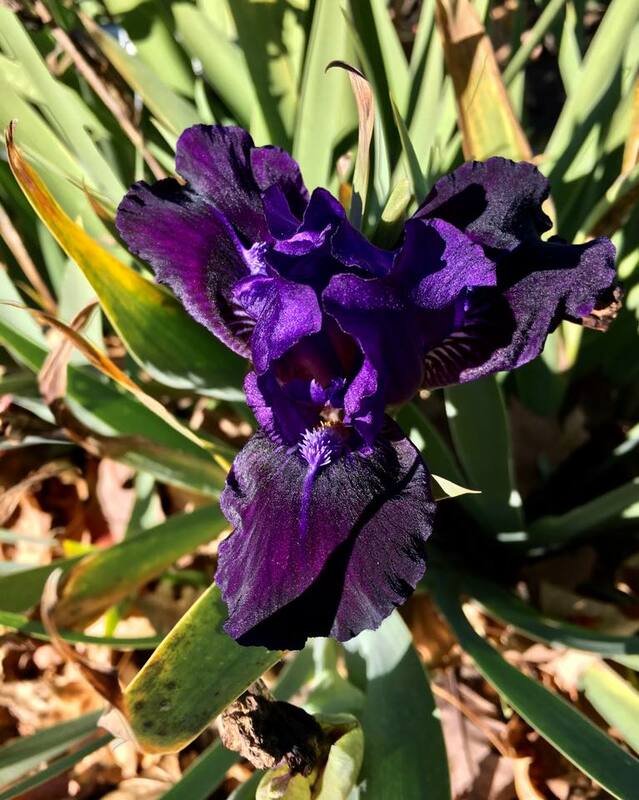 Seedling K 1 A., R. SDB, height 10″ (25 cm), Early bloom and rebloom (Sept. & Oct. in VA). 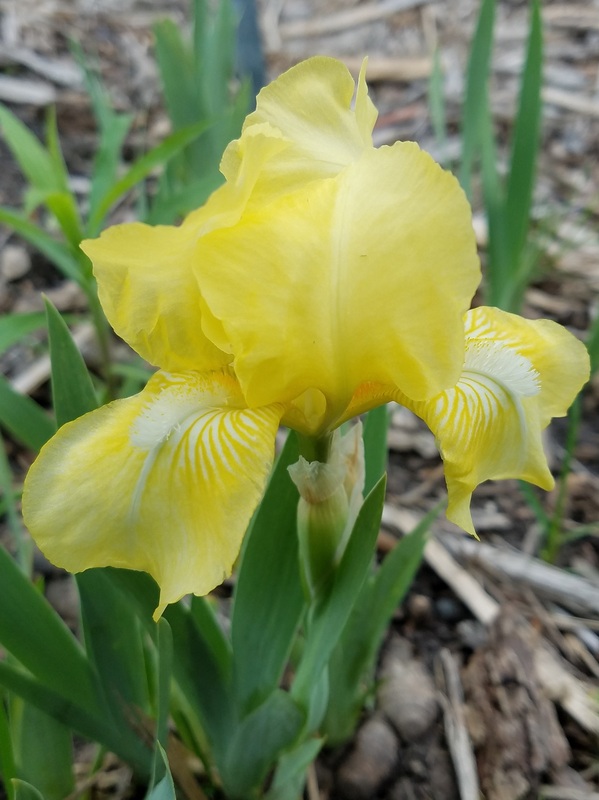 Light yellow with small white spot on Falls; cream beard. ‘Baby Snowflake’ X ‘Twice Blessed’. Avonbank 1979. Honorable Mention 1981; Award of Merit 1986; Cook-Douglas Medal 1989. MDB Beetlejuice – (Paul Black, R. 2013) Seedling #Q80F. MDB, 7.5 (19 cm). Early to midseason bloom and rebloom. Standards pale buff-pink, mid red-violet plicata stitched edge, random dotting over center, dark purple-black midrib; style arms red-grape crest and midrib, light rose edge; falls buff-cream, widely spaced purple-black eye lash lines along beards extending 3/4 way down falls, grape sanding on outer edge of haft; beards red-orange in throat, mid-orange in middle, white ends, hairs based white; slight sweet fragrance. ‘Chart’ X ‘Kaching’. Mid-America 2013. Honorable Mention 2015, Award Of Merit 2017. TB Before The Storm – (Sterling Innerst, R. 1988). Seedling 2333-10. TB, height 36″ (91 cm), midseason bloom. Black; black beard tipped bronze; slight fragrance. ‘Superstition’ X ‘Raven’s Roost’. Innerst 1989. Honorable Mention 1991; Award of Merit 1993; President’s Cup 1995; Wister Medal 1995; American Dykes Medal 1996. ‘Best Bet’ 1988 (Schreiner, R. 1988). 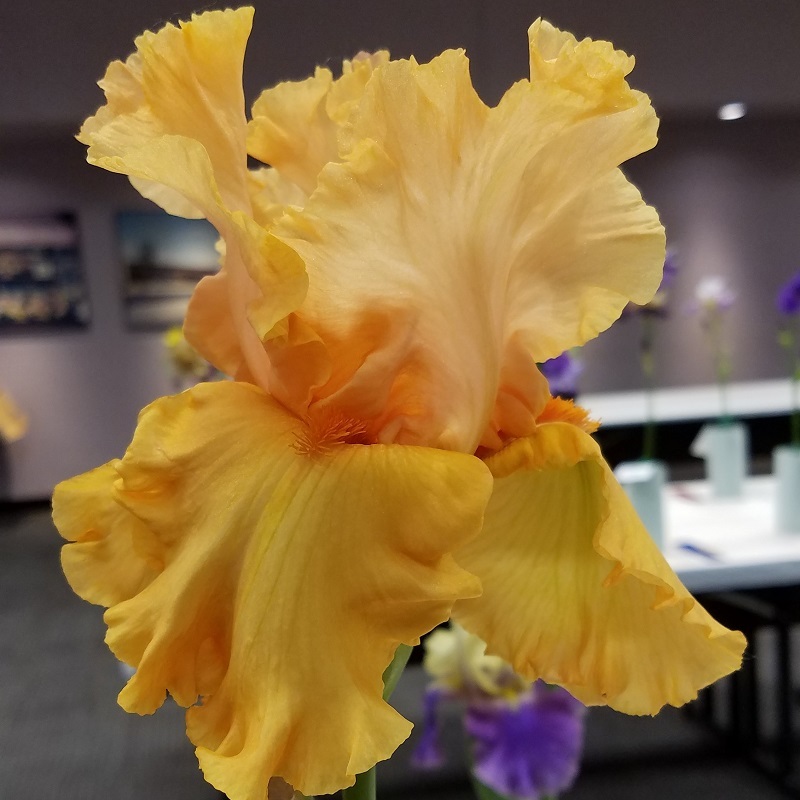 Seedling# T 399-D. TB, 36″ (91 cm), Early bloom and rebloom. Standards light wisteria blue (HCC 640/3); falls moorish blue (739); old gold beard; lightly ruffled. 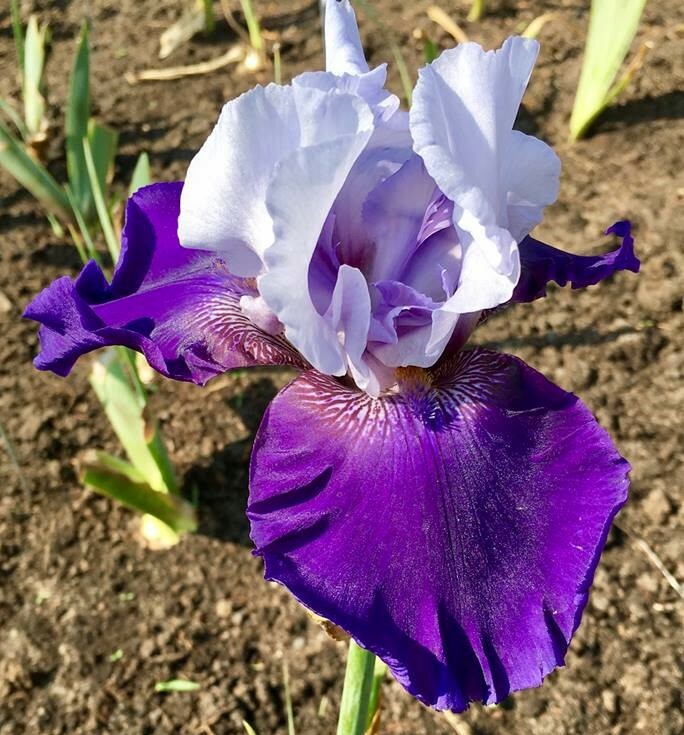 Seedling#M 1085-A: ((‘Amigos Guitar’ x seedling# A 828-A) x ‘Navy Strut’ x seedling# G 119-1, ‘Royal Regency’ sibling)) X ‘Titan’s Glory’. Schreiner 1988. ‘Black Gamecock’ 1980 (Frank Chowning, R. 1978). Seedling FC77-12. 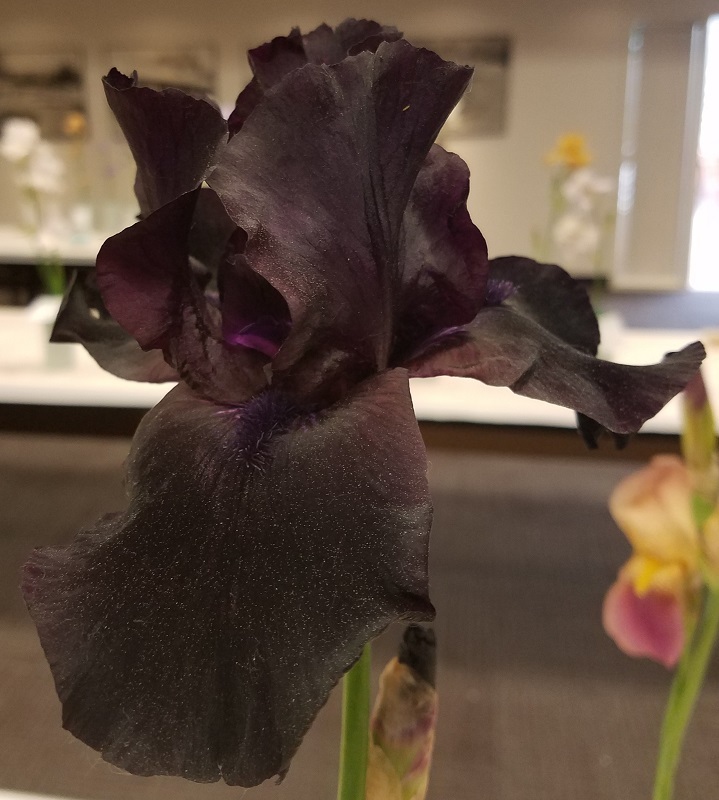 LA, 24″ (61 cm), Late bloom. Blue-black (RHS 103A) self; narrow gold line signal. Unknown parentage. Melrose Gardens 1980. Honorable Mention 1982; Award of Merit 1986; DeBaillon Medal 1989. Award(s):High Commendation 1979, 1981; Honorable Mention 1986; Williamson-White Award 1988. Award(s):Honorable Mention 2008, Award of Merit 2010; Wister Medal 2013. Bloom Chart 2017:Bloomed June 2-21, in 2017 at the Minnesota Landscape Arboretum. PBF:Has light color at base of leaves. Award(s):Honorable Mention 1992; Award of Merit 1994; Wister Medal 1997. Award(s):High Commendation 1980; Honorable Mention 1983; 2nd Vienna 1985; Award of Merit 1986; Caparne-Welch Medal 1989. Bloom Chart 2017:Bloomed May 29 - June 13, 2017. Award(s):Exhibition Certificate 1986; Honorable Mention 1989; Award of Merit 1991; Sass Medal 1994. Bloom Chart 2017:Bloomed May 16-28, 2017. Autumn Queen http://wiki.irises.org/Main/Mdb/MdbAutumnQueen 1926, Sass ‘Autumn Queen’ (Hans Peter Sass, 1926). 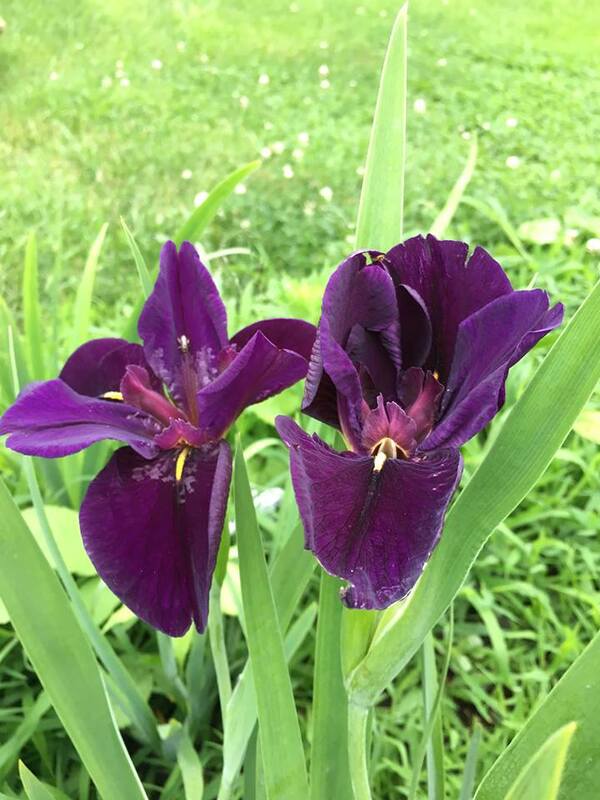 DB, Early bloom and rebloom. Color Class-W1. 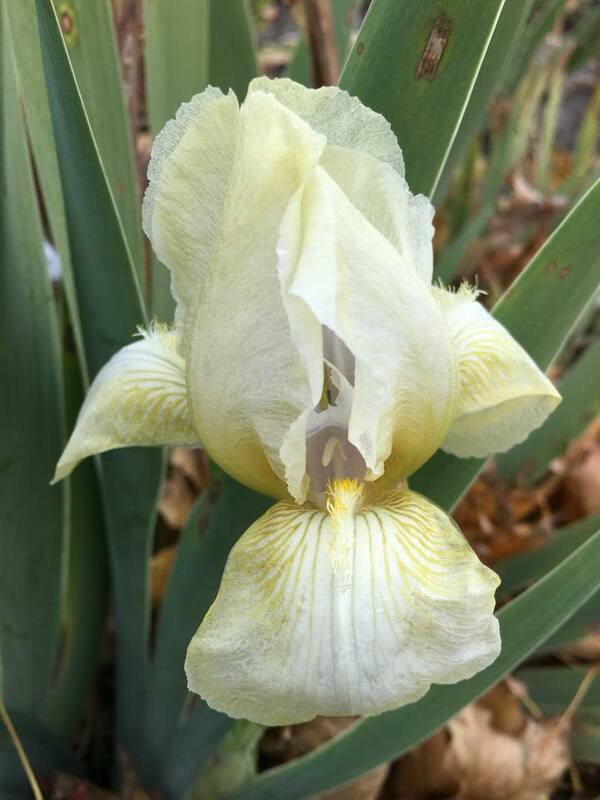 Note: Also listed in Sdb web because of height variation: ‘Autumn Queen’. Standards Color:White, shot, stippled and edged rosy lavender. Falls Color:White, edged rosy lavender. Bloom Chart 2017:Bloomed May 17-28, 2017 at the Minnesota Landscape Arboretum. 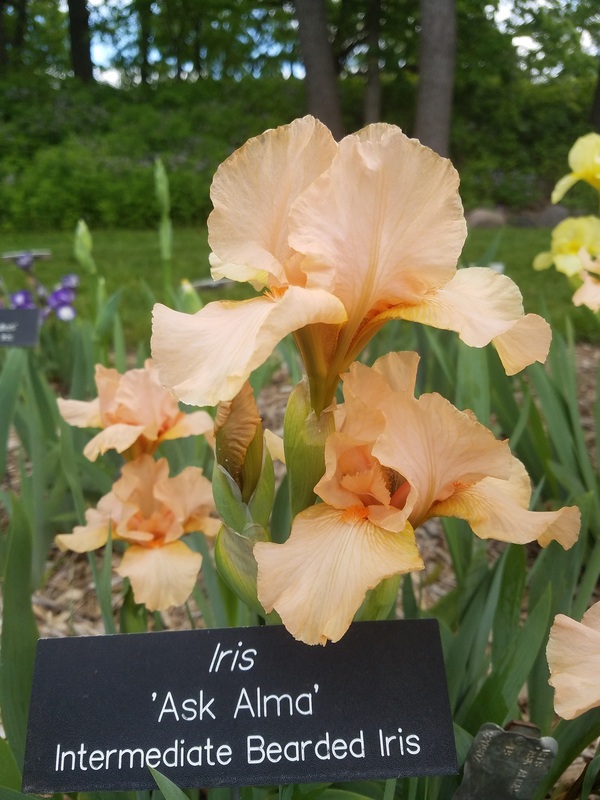 Bloom Chart 2017:Bloomed May 31 - June 6, 2017 at the Minnesota Landscape Arboretum. Beards Color:Yellow in the throat fading out to cream at the tip. Bloom Chart 2017:Bloomed May 1-16, 2017 at the Minnesota Landscape Arboretum. Award(s):Honorable Mention 1993; Award of Merit 1995; DeBaillon Medal 1998. Bloom Time:Early to midseason bloom and rebloom. Award(s):Honorable Mention 2015, Award Of Merit 2017. Award(s):Honorable Mention 1991; Award of Merit 1993; President's Cup 1995; Wister Medal 1995; American Dykes Medal 1996.